Geoff was kind enough to not only organise these two-hour pool sessions, but to also load up the CKC trailer and bring the Club sea kayaks south of the river. With help of members, we cleaned the boats and then set them afloat in our dedicated half of the swimming pool. With some people bringing their own boats, we had another 15 people on the water last night going through some of the basic – yet essential – safety skills we often avoid when on the not-so-clean Thames tideway. 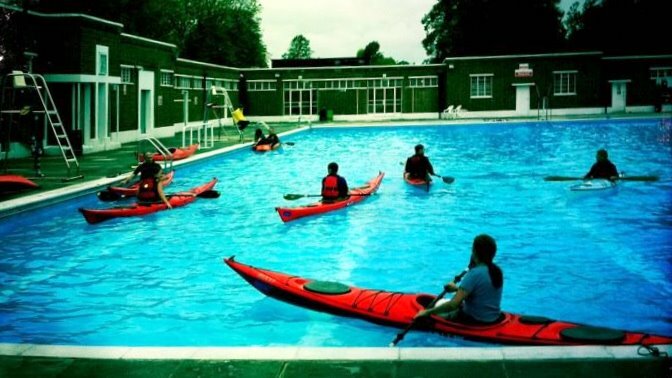 Knowing that this would be a ‘wet session’ people didn’t hesitate to get stuck in and were soon dangling from their boat underwater either practicing or learning how to roll in a sea kayak. With coaches bobbing between these small groups of paddlers – both CKC members and guests from other London clubs – it wasn’t long before people were pushing themselves and attempting self-rescues and re-entry rolls. Regular practice of these skills is essential and incredibly useful when we head off on sea trips and expeditions, as you never know when a wave might take you by surprise and tip you over (or out). 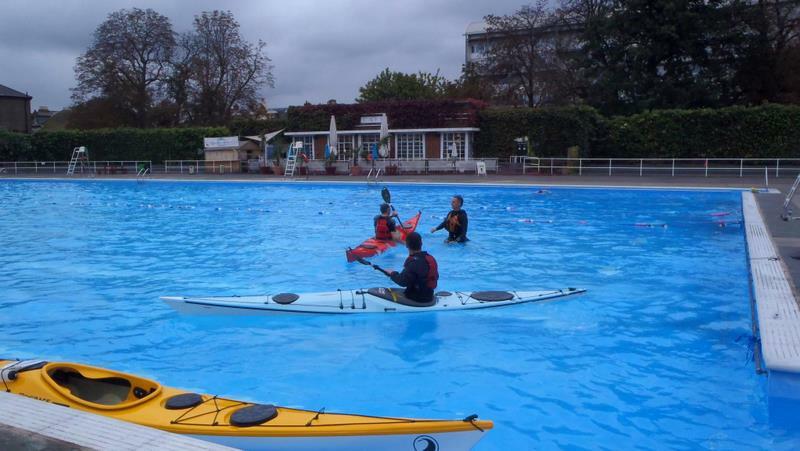 The regular pool sessions at the likes of Brixton and Fulham (see FAQs) are good for learning the skills, but they tend to be in smaller river running boats, so this was a great opportunity for doing it in the bigger, more buoyant, sea kayaks. With the light fading we all had to jump off the water at around 7pm, but with the full intention that at the first available opportunity we’d be back again and running another session, especially as it ended with us heading to the ‘Lido Café’ for nice burger and pint. The Brockwell Lido will be closing for repairs in November, so we hope to start up regular skill sessions with them, when they re-open in the new year. Excellent shout for using this pool, thanks for organising, Geoff! Yes, I’d like to also add my thanks to Geoff for organising the session and for giving us his time (and Richard too) during the session. Many thanks. 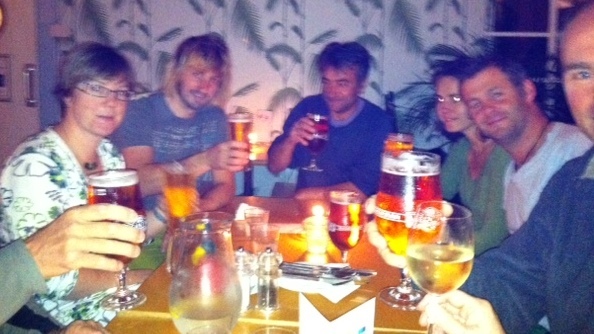 ps… +1 for the regular sessions when the Lido re-opens.